Each action you make on your computer is reflected in the system Registry. As you download content, install/uninstall applications….etc. the registry becomes cluttered with broken, useless and empty entries that can affect your computer’s performance. Reg Organizer is a comprehensive application that includes a collection of tools for optimizing the registry. The application lets you easily and safely view, edit and clean the registry. It also allows you to preview any registry files you want to import. 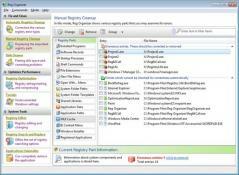 The built-in registry cleaner will defragment, repair and optimize the registry. - Detects and repairs a large number of errors such as invalid references to files, folders and DLLs, invalid uninstallation data, obsolete/invalid file extensions...etc.